This soup recipe is to die for. I adapted the recipe from here to my liking. Heat all the ingredients minus the bacon and cheese over low for 15 minutes, stirring often. To serve, ladle into a bowl and garnish with bacon crumbles and parmesan cheese. Yum! I'm adding this to my list! Thanks for sharing the link to my recipe. So delighted that you liked it and gave it your own twist. Happy Pumpkin Season! This looks and sounds amazing! Our local restaurant has a delicious pumpkin soup, I would love to try to make one at home! Sounds so easy and delicious - thank you! This sounds so good.... I am trying it this week end.... I made your chicken and wild rice soup when you posted the recipe for it and it has been a staple in our soup menu's ever since... Every time I make it for company I get asked for the recipe I actually have it written on recipe cards ready to hand out, and I include your blog address so they can come and see all of the great things you do !! That is way too cool! Thank you!!! 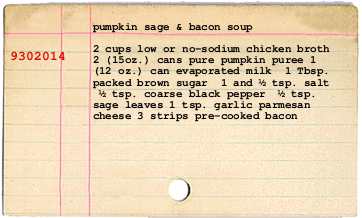 I made this soup this past week end... it was DELICIOUS.... and so easy. The only modification I made was I added a cube of butter at the end to add a creamy consistency to it..... it has been added to my favorite soup recipes.... YUM YUM Thank you for sharing this recipe with us. This looks really easy and looks delicious, I think it will make a really nice soup with a few piece of bread for dipping :) nice recipe! Im,curious about the soup. Is it yoo sweet with the brown sugar?